Established in 2002, The Alan B. Shepard Society celebrates Commander Shepard’s achievements and his legacy of exploration. Members of the Shepard Society make annual gifts of $1,000 and greater to support the Adler’s exhibitions, sky shows, and visitor programs; and help the Adler serve 550,000 visitors a year with inspiring science experiences. Shepard Society members also enable education, outreach, and research programs. 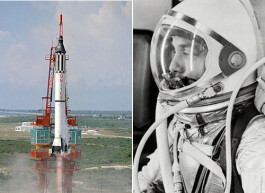 In 1961, Commander Alan B. Shepard successfully completed America’s first manned space flight. His achievement electrified people around the world and sparked a decade of unparalleled discovery in space. Today, Commander Shepard’s legacy of adventure inspires our pursuit of knowledge about the Universe and our place within it. Chairs of The Alan B. Shepard Society are civic leaders who endorse the education, research, and advocacy mission of the Adler Planetarium. They provide leadership to the Adler and serve as ambassadors for the museum in the community.